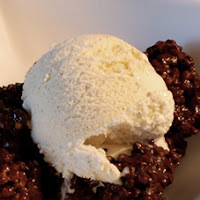 Tapioca makes a good pudding home, and it was a favorite in our family when I was growing upward. It’s an easy sweet to ready and good solace nutrient for the Winter. Since it has rather a nonaligned preference, nearly anything can be added for flavouring. Tapioca comes from the cassava origin - a plant originating in Brazil but now popular across Africa, South America and Asia as its origin is nutritious and can be used for making many types of nutrient. In these parts it comes in pearl or flour kind (used as a gluten available option to wheat flour), and it’s the pearls I take. Add 100 ml of the milk in small parts, mixing until you have a smooth paste. Transfer into a small saucepan, add the rest of the milk and tapioca, and heat over a low flame. Stir continuously, keeping the pudding just below a simmer, until the pudding thickens and the pearls become clear (about 20 minutes). Top with vanilla ice cream and serve!